Moving the initial reading to after part 1 or 2 would be a more active way to engage students in the activity. Good to pair students doing this investigation. Pre-load Google Earth and associated files on computers. Activity provides a rich collection of print and media resources about scientists studying permafrost in Alaska and Siberia. Data sources are NSIDC, NCAR, NOAA, and NASA, in addition to unique historical permafrost dataset from Siberian Russia. Excellent use and application of science data with a problem-based scenario. Suggested resources for further study are current and good for given grade level. Comments from expert scientist: This is a very good interactive course material for students to learn the topic with an example introduced. 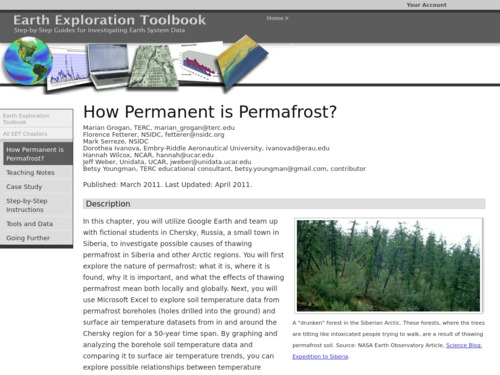 Activity begins with a case study to engage students' interest in the problem of thawing permafrost. Step-by-step structure of the data access and analysis parts of activity might be difficult for some students to follow easily. Show/hide feature allows students to compare their graphs with a model. Good organization of learning materials and a logical learning sequence leads students to analysis and understanding of complex data sets. Instructions are clear, thorough, and well-written. The case study provides good background information for students (and teachers). Excellent "Going Further" activities for advanced students. Activity begins with a lengthy reading, which may be a challenge for some students. The "show me" feature that helps students through problems and procedures using software is exemplary. Some students will need support guidance with data access and analysis steps. Entire activity online. Students just need to follow the steps.